As we learned from the nest cam, the male Peregrine Falcon now in Kalamazoo is a different bird than the male that was here last year. The new male has a band number of 81/D (black / red). He was hatched and banded in 2010 on a building in downtown Lima, OH, which houses the Chase Bank, and looks remarkably similar to the Fifth Third Bank building here in Kalamazoo. So, Kewpee is no stranger to the banking industry. Although his name was not officially entered into the Peregrine data base, a blog post from the time of his banding indicates that he was named Kewpee, after a restaurant in Lima. Kewpees are the 2nd known chain of hamburger restaurants, founded in 1923 in Flint, MI. Kewpee restaurants are named for the infamous chubby Kewpie doll, a cherub-faced character whose idea is to teach people to be merry and kind. Kewpie, in turn, is derived from Cupid, the Roman god of Beauty. Kewpee (the peregrine) was identified as a female at banding due to his size. Gender identification of peregrines at banding is a best guess. Females are larger than males, so the larger birds in a clutch are usually female. Kewpee must have been larger than his male siblings (maybe chubby like the doll). In a previous post, I had erroneously stated that male peregrines have black and red bands, and that females have black and green bands. 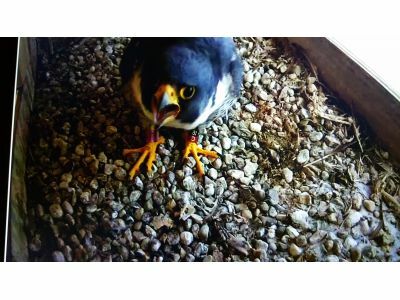 Although that is how the two falcons in Kalamazoo are banded, there is not an official color / gender code for banding. The bicolor black/red and black/green bands indicate a peregrine that was banded in the nest from the eastern United States, but either color combination are used on either males or females.